picture at the Brown Bear Claim (K-6) after their final clean-up. 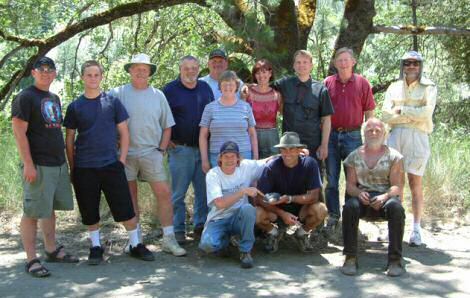 This Group Project took place on the Brown Bear claim along the Klamath River at K-6, around two miles upstream from Horse Creek, about 50 miles upriver from Happy Camp. There were thirteen participants (11 men and 2 woman), including myself and two helpers. Two of the participants were dredging for the first time ever, one who was uncomfortable going under water when we began the week. Most of us put up in the campground at Brown Bear for the week. There is a USFS river access there, where non-fee camping areas have been developed. This made it nice and convenient after the long workdays during the project. We chose Brown Bear for this project because it is a rather long claim that includes a lot of river diversity; slow, shallow areas, rapids, directional changes in the river, etc. New 49er members made a strike on this claim in the mid-90’s, so we already knew high-grade gold was traveling through this section of river. Having both new and advanced dredgers on a project allows us a lot of sampling options. I hoped that if we hit the area hard with enough sampling, we would find some rich new deposits. As we already knew where an earlier deposit had been located below a set of rapids, I directed our more experienced participants to position a 5-inch dredge out in the middle of the rapids and do a sample there. I know this sounds difficult, but there were big boulders out there blocking the river’s flow, creating big pools behind, where the dredge and divers were protected. The Klamath had dropped down to summer-low flow levels, so it was not that difficult. They dredged the hole down through about 4 feet of original grey Klamath River hard-pack (never been mined before by anyone) on the first day, and were recovering some nice sized flakes of gold. Everyone was really happy about the assortment of nuggets that were found. Although it was nothing to get excited about yet, the big flakes were an encouraging sign that we were on the right track. Sampling on the top of the Brown Bear claim in about two feet of water. We used two 4-inch dredges during the first two days of the project to complete two other sample holes to bedrock on the far side of the river (away from the highway) across from our campground. These holes needed to be dredged, as we were looking for the common path that the high-grade gold is following in that section of the river. The pay-streak located downstream from there in the mid-90’s was also on the far side of the river. So it seemed like a reasonable bet that we might find some high-grade where we were sampling further upstream. Because the water was slow and shallow there, this was a good place to help our less-experienced and beginning participants get more comfortable underwater and guide them in the basics about how to operate a dredge, how to do things underwater and what to look for when prospecting. We were finding some beautiful hard-pack over there, and the bedrock had plenty of irregularities to trap gold. But by the end of the second day, we had determined the general path of high-grade gold was not traveling along the far side of the river. The more-experienced guys had reached bedrock out in the middle of the river on the second day, and established that was where the high-grade is traveling through that section of river. They were recovering lots of nice flakes and some nuggets out there in about 4 1/2 feet of hard-packed grey material with some pretty large boulders. We were getting pretty excited about that. We all worked as a team on the third day to clear a platform on the near bank, just under our campground, and set up the 12-ton winch. That took about half the day. The second half of the third day was invested into grooving-in participants how to operate the winch and coordinate as a team to pull big rocks out of the dredge hole. After a bit of trial and error, we had it down pretty well. I always start feeling real proud when I can stand back and watch participants pull together to get the important work done which results in high-grade gold and nuggets being recovered from the river. In short order, they pulled enough boulders out of the hole to get a work area opened up. Into the fourth day, over half the participants were venturing out to take shifts on the 5-inch dredge in the middle of the river. We were tightening up the winch cable from the bank to create a handhold so they could walk out there. It was working out pretty well, and the gold was adding up. 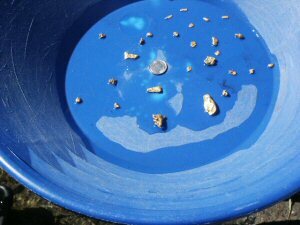 Large and small flakes of gold started showing up in the 4-inch sluice boxes right away! However, that was only one dredge producing gold for us. Not good enough! And, even though they were getting better at dredging, a number of the participants were still not comfortable going out into the middle of the Klamath River to dredge in a set of rapids. to place the gold deposits on one side or the other of the river. 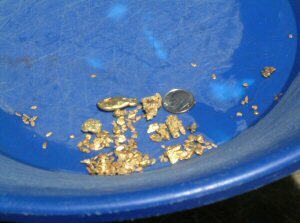 This was all taking place while a small team continued the dredging and winching program downriver, so the gold would be building up in our bucket. 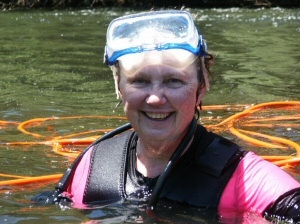 Peggy Derrick smiles after coming up from a dive. By the end of the fourth day, we were sampling upriver using the two 4-inch dredges. Two of our more experienced teammates sampled the highway-side of the river, just downstream on the inside bend under a set of rapids. This was a textbook location to find a rich pay-streak, but they were finding loose streambed material that had apparently washed in there from winter storms. At the end of the day, they finally had to give up that sample hole, because the loose material was too much for the 4-inch dredge to make any meaningful headway through. While those guys were doing that, my primary focus was in helping our two least-experienced participants to do their first sample hole on their own, from start to finish. We were on the opposite side of the river where the water was shallow and slow, with bedrock sticking out of the water in places. Frankly, because the area was so easy to dredge, I did not expect to find much gold there, believing that other members must have dredged this place during the past. When it was time to start this test hole, with just a little help, one of the new-dredgers went right under and started to get some work done. The other still had some anxiety to overcome about going out in the river underwater. This is not unusual. It is common to have a few people in each project that need a little extra help to get though the underwater basics. This person had been dredging in the days before, but was still pretty nervous about going underwater. I always use some gentle encouragement and spend the necessary time as a personal lifeguard to help first timers get through the stressful early stages. It seldom takes very long. Once a beginner gets busy underwater (especially when gold is being recovered), he or she usually overcomes the trepidation in a matter of hours. Getting all the participants through this stage is one of the several things I must accomplish in every one of these projects. This, so that we can get them productive as soon as possible. Finding enough gold to split off at the end of the week, with the participants actually doing most of the work, is another one of my missions! After about an hour of dredging, our two beginners came up for a rest, pretty excited that they were seeing flakes of gold on the bedrock. There was no longer any fear. That part was already long-forgotten. We looked in the sluice box, and it was speckled with small and large flakes of gold. This was the first time in all our projects that beginning-dredgers actually went out and located a pay-streak on their own. I’ll never forget the feelings of enthusiastic accomplishment. It is also the first time we have located two high-grade pay-streaks in a single project! Everyone was feeling pretty good around camp that night! The fifth and sixth days of the project are now just a blur to me. In fact, I probably could have taken those days off and it would not have mattered much to the final outcome. All of the participants worked together to pull themselves into a production team. Everyone had already graduated from the basics. The 5-inch dredge no longer required any winching, because the hole had been opened up enough to allow bigger rocks to be rolled back as progress was made. All but just a few of the team members invested a shift or two on that dredge, mainly to get a first-hand look at what the original (virgin) Klamath River streambed material looks like. 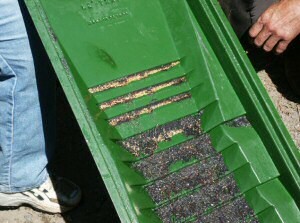 The top of the finishing-sluice was filled with gold during final clean-up on the last day. 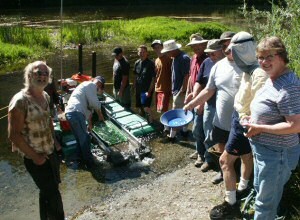 And everyone also spent some time working the 4-inch dredges in the pay-streak upriver. That deposit consists of a foot of hard-packed streambed on top of shallow bedrock in one-to-six feet of water. The dredging in this pay-streak is so easy, I almost felt guilty putting in my own shifts. However, the overwhelming amount of enthusiasm from all the other team-mates helped me get though my guilt. Miners helping miners! We spent the seventh day floating gear out, doing the final clean-up and splitting off the gold. 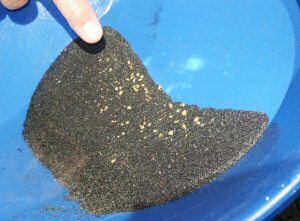 In all, we recovered around 2 ¼ ounces of gold, mostly nice flakes. About a third consisted of nice nuggets, the largest which was 4 pennyweights (almost ¼-ounce). My best guess is that there should be a strong high-grade line of gold going right down the middle of the river on K-6 from just below the USFS river-access to well below the rapids. Just as our project was coming to an end, several members were already converging upon the upper pay-streak we had located; the easy one. Smart move!! I floated a dredge though about ¼-mile of river down to the USFS river access from the upper pay-streak when the project was over. There is lots of bedrock showing in that area, too. And it is located between the two pay-streaks we located last week. It is silly to think there is not some high-grade to also be recovered out of that stretch. Check it out!